Is "par excellence, " the queen of all the swells. But I christened her my darling Mignonette. There's a band of opera music in her laughter. 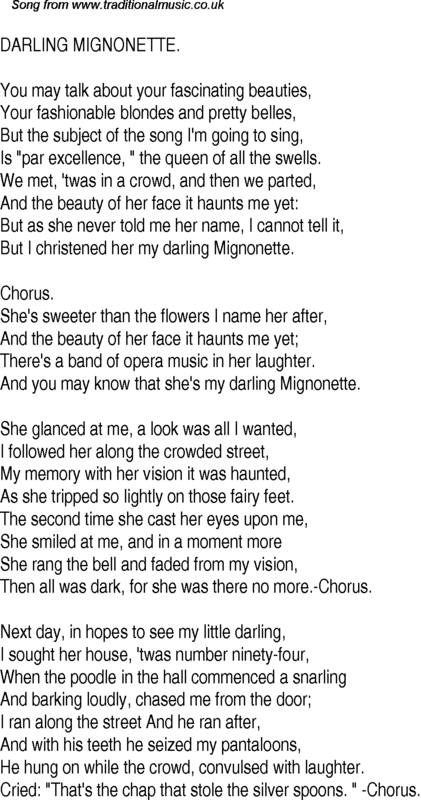 And you may know that she's my darling Mignonette. As she tripped so lightly on those fairy feet. Then all was dark, for she was there no more.-Chorus. He hung on while the crowd, convulsed with laughter. Cried: "That's the chap that stole the silver spoons. " -Chorus.